The death has been announced in Florida of Larry “Rhino” Reinhardt, one of the founders of Captain Beyond, on Jan 2. 2012 at the age of 63. Having been with The Allman Brothers for a time, he was recruited by psych prog-rockers Iron Butterfly. 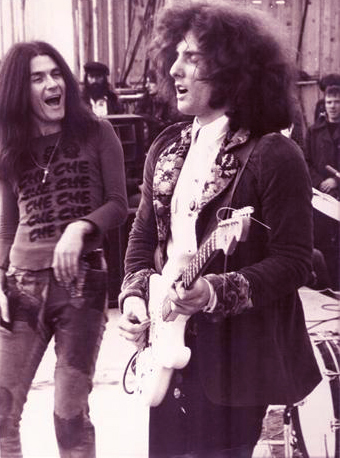 After they broke up in 1971 Rhino formed Captain Beyond with Iron Butterfly bassist Lee Dorman, ex-Deep Purple vocalist Rod Evans and Johnny Winter band drummer Bobby Caldwell. 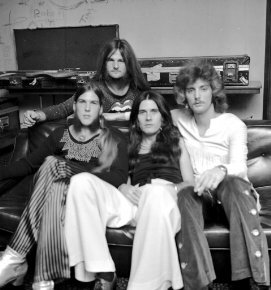 Although the band never scaled the heights of some of the US prog rock outfits, they were nevertheless well regarded and retain a following amongst fans of the genre. The band was Evan’s last major rock outing (he did their first two albums), though Rhino continued to work albeit on much smaller scale projects right up until last year. There is a Rod Evans family tree which looks at this part of his career on the DTB website. A great loss. Rhino’s talent, extraordinary and influenced Lo Woods and many others. rip Larry, rock on! The Captain Beyond reunion around 2000 produced a studio 4 song ep demo that I don’t think was ever picked up and released. If you want to hear one of the great rock guitarist’s finest work listen to it (it’s online). I met Rhino in late 2009 and over the next year got to know him a little. He truly was one heck of a nice guy! The first Captain Beyond album is an absolute classic disc. Great riffs and drums and Rod Evans was excellent! What a shame about Larry, he looked to be in very poor health in the last couple years. There’s a company called RAVEN out of Australia who put out a very nice remastered 2 on 1 with both CB albums on one disc. A true legend and (especially on the Captain Beyond debut), one that leaves behind a legacy of awesome guitar playing and complex sonic riffery from beyond this world. Alas it seems to this writer, with Du Cann and Rhino departed, that life is now somewhat quieter and somehow less magical than it once was. RIP in peace Larry, and thank you for your music; it’s certainly made my world a more wondrous place. Here are two newspaper article links from Bradenton Herald and Sarasota Herald Tribune about his passing. Rhino was from the Bradenton-Sarasota area which is about 40 miles south of Tampa, Florida. He died in his hometown of Bradenton in Manatee County. Articles give some history of his beginnings and what he was currently doing before his demise from illness in Manatee Memorial Hospital. Think I first heard Iron Butterfly on that Age Of Atlantic album in 1970. They opened side two with Termination. All quite fascinating to me at that time as I’d never heard this sort of material before. Brilliant guitar player! His work with Iron Butterfly and Captain Beyond are amazing, unforgettable. What a loss. Sad to hear… His music will live on forever though! Sad news. I have always regarded the two albums Evans recorded with Captain Beyond as quite exciting. I wonder if Rod and Rhino have kept in contact over the years? Maybe Rod will surface in some way someday. He lives somewhere near myself here in Northern California I believe.